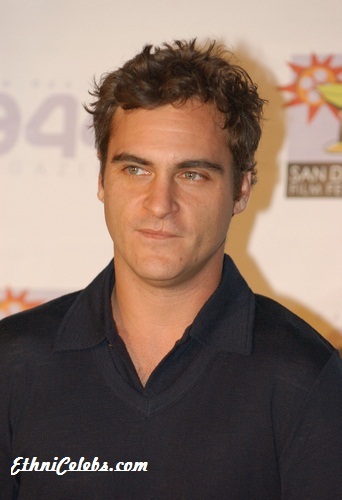 Joaquín Phoenix, previously also credited as Leaf Phoenix, is an American actor, musician, producer, music video director, and activist. He is known for his roles in the films To Die For, Gladiator, and The Master, among many others. He is the brother of late actor River Phoenix, as well as actresses Rain Phoenix, Liberty Phoenix, and Summer Phoenix. He was born in San Juan, Puerto Rico, to parents from the continental United States, and was raised in Florida and California. At one point, Joaquín’s parents joined the religious group Children of God, which they later left. Joaquín is the son of Arlyn Phoenix (born Arlyn Dunetz), a social activist, and John Phoenix (born Johnny Lee Bottom). Joaquín’s mother is Jewish; half of her family are Russian Jews and the other half are Hungarian Jews. Joaquín’s father is of mostly English descent, along with at least 1/128th German, from his ancestor, Johan Jacob Peter Kimberlin, and French Huguenot roots from another, distant, ancestor, Francis Posey, from Cambray, France. I’m Jewish… But I don’t think I’ve ever been very religious, no, though I do consider myself a spiritual person. I appreciate a lot of traditions from various faiths. I’m on a path. Joaquín’s paternal grandfather was Robert Merrill Bottom (the son of William Dell Bottom and Cordelia Pearl Matherly). Robert was born in Kentucky, as were all of his grandparents. William was the son of Fidellar/Phidellar Sharp Bottom and Rachel Ann Bolling/Bowling. Cordelia was the daughter of David Houston Matherly and Sarah Frances Purdom. Joaquín’s paternal grandmother was Beulah Ernestine Ingram (the daughter of Robert Lee Ingram and Mary Elizabeth Leach/Leidy). Beulah was born in Missouri, and Beulah’s grandparents were born in Tennessee (two), Illinois, and Iowa. Mary Elizabeth was the daughter of William John Leidy and Sarah Clarissa Dyer. Joaquín’s maternal grandfather was Meyer Dunetz (the son of Samuel/Sam Dunetz and Libbe “Sallie” Grodenzik). Meyer was born in New York. Samuel and Libbe were Russian Jewish immigrants. Samuel was the son of Moses/Moshe Idel Dunetz and Shifra. Libbe was the daughter of Simon Gordon and Menucha. Joaquín’s maternal grandmother was Margaret “Margie” Lefkowitz (the daughter of Ignatz Lefkowitz and Mary Beck). Margaret was born in New York, the daughter of Hungarian Jewish immigrants. Ignatz was born in Imre, Zemplén, Hungary (now Malčice, Slovakia), the son of Herman Lefkowitz and Rose Greenwald. Mary was the daughter of Ignatz Beck and Maly Frankel.